A youth spent scraping for survival in the slums of Rukongai has left Shizuka adaptable, resilient and self-reliant. Quiet and observant, she often gives the impression of being withdrawn, though in fact she is keenly aware of her surroundings. This sensitivity to those around her combined with her ability to adapt quickly to most situations makes her easy to get along with, but her caustic wit occasionally sparks heated arguments-- try though she does to restrain it. Of her many friends few truly know her well, as she is slow to trust and reluctant to open up about herself. She can be difficult to work with; her fierce independence prevents her from asking for or accepting help from others, and her distrustful nature causes her to question authority and resist following orders. [ Physical Stature ]: 5'4" /127 lbs. Shizuka has long black hair kept out of the way by wearing it up in a messy knot, though a few strands are constantly escaping to hang down in front of wide grey eyes and frame a small, pale face. She fights with two blades, her zanpakutou and a battered but graceful katana that she refused to give up when assigned her asauchi by the Shinigami Academy. Both swords are carried in a double-ended sheath on her back. She has a small tattoo, but will not divulge what or where it is. She carries herself with an unassuming air that lets her easily pass unnoticed in a crowd. 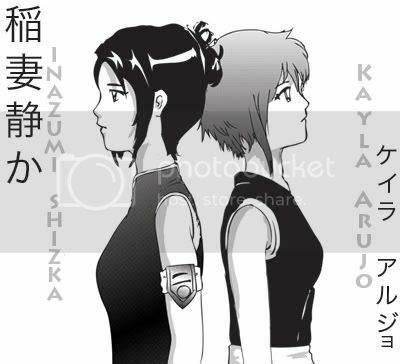 Having arrived from the living world in Area 79 of West Rukongai the year that Kyubantai-taichou Shorin was murdered by the hollow Emptybones, Shizuka never knew a Soul Society free of war and chaos until recently. Consequently, she is neither embittered nor disillusioned by the hardship and suffering she, like all people in Soul Society, has undergone, and deals with her troubled past as she does all adversity: pragmatically. With the return of peace and order to Soul Society after the defeat of Emptybones, she entered the newly formed Shinigami Academy simply because she didn't know what else to do; fighting was the only way of life she'd ever known, survival the only goal. In her early days in Rukongai, her strong spiritual pressure and talent with a sword gave her an advantage over her peers-- an advantage that she used to protect those she could from the brutal violence taking place all around them. During the years of the Great Hollow War she joined the resistance forces to fight alongside Rukongai citizens, shinigami, and Quincy alike against the hollow invasion. There she met and became close friends with Motomeru Kaigen and Kouketsu, 'twin' brothers who came to Rukongai from the living world on the same day and had been inseparable ever since, though they were complete foils to each other. Fighting and training alongside these two, Shizuka's strength and skills increased rapidly, and the three of them began to attract the notice of the shinigami leading their forces. As the war progressed, Kaigen and Kouketsu were promoted to one of the strongest fighting units, while Shizuka was recruited to an intelligence-gathering unit in the same sector. She excelled in stealth operations and rose quickly through the ranks of her unit, until one night, during the height of the war, she joined a mission into the hollow-occupied centre of Seireitei that erupted into fierce battle as the team returned to Rukongai. The tragic end to that battle haunted her through the long period of her recovery from the extensive injuries she'd received there. She was slow to heal, due to both the severity of her wounds and the utter indifference she felt towards her condition. It was only with Kouketsu's constant support and encouragement that she was eventually able to return to her training and join the effort to rebuild Soul Society. After lengthy persuasion from Kouketsu, Shizuka enrolled in the Shinigami Academy and prepared to leave her life in Rukongai behind. She felt little regret at leaving; most of her friends from her early days in Area 79 had either died or moved on to safer regions. There was one person she couldn't bring herself to abandon there, however, a young girl named Kayla who had come to Rukongai at the end of the war and had been scraping by without a family ever since. Driven by pity and a strange sense of kinship with the girl, Shizuka resolved to take her out of Area 79 and bring her to safety in the inner regions of Rukongai before entering Seireitei herself. The two traveled together toward the centre of Soul Society, and parted ways when Shizuka entered the Academy. Now, six years later, she had graduated with the first class of the new era and was beginning her life as a shinigami. Kouketsu is affable and good-natured, though he is capable of intense ferocity when angry or in battle. It takes a great deal of provocation to make him lose his temper, however, as he is by nature cautious and thoughtful, and will always consider a situation from all perspectives before acting. 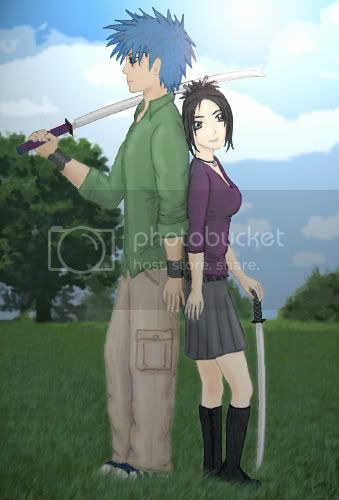 He is loyal to his friends and those he respects, and is very protective of Shizuka, in particular. In fact, he worries about her more than he lets her know. [ Physical Stature ]: 6'4" , 237 lbs. He has close-cropped black hair, dark eyes and dark skin. His height and heavy, athletic build can make him seem intimidating, but his imposing stature is tempered by his usual good-natured expression. He has a tendency to let his thoughts show on his face, but is aware of this habit and with some effort is able to mask his emotions when necessary. Like most right-handed swordsmen, he carries his zanpakutou at his left hip. Like Shizuka, Kouketsu was sent to West Rukongai upon his arrival in Soul Society, though it was his good fortune to land in Area 59 rather than 79. Finding himself alone in an unfamiliar world, he wandered the streets of his new neighborhood for about half an hour before (literally) running into a smaller boy of the same age, who, after picking himself up from the dirt and challenging Kouketsu to fight-- despite the latter's significant advantage in size-- introduced himself as Kaigen and revealed that he too had only just arrived in Soul Society that morning. They stuck together for the rest of the day, and in the days that followed, because Kaigen refused to leave him alone unless Kouketsu agreed to fight him, and Kouketsu tolerated his pestering because he secretly appreciated the company in that bewildering period of adjustment to life as a soul. They grew inseperable, and were soon recognized throughout the neighborhood as the Motomeru twins, though a more dissimilar pair of twins would be hard to imagine. As they grew older, both showed signs of developing spiritual pressure, and when the citizens of Rukongai formed resistance forces to defend Soul Society during the Great Hollow War, they were recruited to their local division. They excelled in their training and were recognized as talented fighters, Kouketsu for his powerful strength and Kaigen for his excellent swordsmanship. It was during this time that they met Shizuka and soon became close friends with her. The twins were promoted to one of the strongest fighting units in their area as the chaos of the war grew to its peak. Both distinguished themselves as forces to be reckoned with in the many battles that took place in those years, until the day their unit received an emergency mission to defend an intelligence-gathering team that was ambushed by Hollows at the border of Seireitei. Though he rarely spoke of that battle to anyone, Kouketsu carried the weight of its consequences ever after. He distracted himself from grief and guilt by throwing all his energy into supporting Shizuka as she recovered from the severe injuries she'd received and dedicating himself to becoming stronger, strong enough to defend everyone around him. Entering the new Shinigami Academy seemed to be the best road to achieving his goal, but he was unwilling to leave Shizuka behind. Using the lessons in persistence he'd learned from Kaigan, he eventually persuaded her to enrol in the Academy as well, and set off for Seireitei with a resolute heart full of determination. Six years later, he graduated among the top ranks of the class of Neo 1 and began life as shinigami in the 6th Division. Meimei: "Dark; invisible; divine" Dakatsu: "Serpent or scorpion; detestation"
Manifestation: A grey and black viper with iridescent green markings and vibrant green eyes. 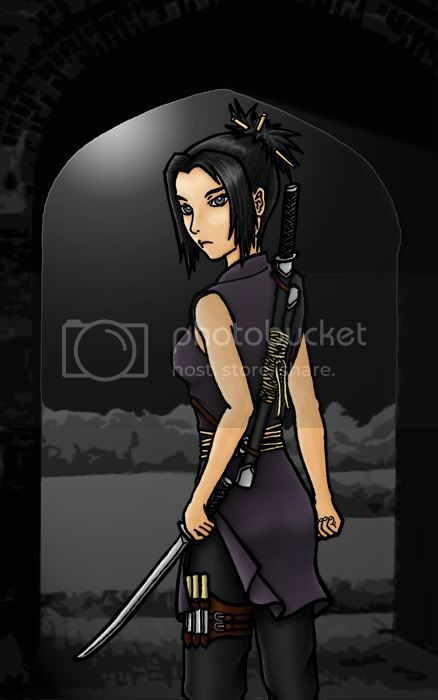 Form: When sealed, Dak is a wakizashi with a 20" blade and a plain, black and grey wrapped hilt. Upon release, the zanpakutou shrinks to a combat knife with a 7" blade that has a fang-like curve to its tip. Ability: The zanpaku's ability lies in producing poisons to attack each of the three elements of a person: the mind, the heart and the soul. The toxicity of these venoms depends on the spiritual pressure of the opponent: the venom will begin affecting an opponent within 50% of Shizuka's spiritual pressure in 2 minutes, and will continue traveling through the system with increasing effect until treated. An enemy with a spiritual pressure less than 50% of Shizuka's will cycle through the symptoms at an accelerated rate, and opponents with 50% higher sp will take 50% longer for the poison to take effect and will have a slowed progression through the symptoms. Releases a venom that affects the blood and damages all flesh that it passes through, causing extreme pain as it moves through the bloodstream. Without treatment the victim will remain in constant pain, unable to sleep or find any rest. Releases a venom that affects the nervous system and causes a progression from mental instability to dementia and then hallucinations. If left untreated the victim will eventually lapse into a coma in which the mind is overcome by delirious dreams. Releases a venom that disrupts the soul's special abilities and connections (ie. connection with the zanpakutou for shinigami, special abilities for hollows), that without treatment will seal them off entirely (until victim is healed). Form: Upon ban release, the zanpakutou returns to its wakizashi size, but maintains the characteristics of its shi kai form, ie. the curved, fang-like tip and cut-out 'hook' near the hilt (see shi kai form image). From the base of the hilt, a chain of transparent orbs forms, the orbs shining black, silver, and emerald green in different lights. Each orb is about 7" in diameter. The chain floats in coils around Shizuka, and she controls its movement. Partway down the chain is a silver ring that she can hold for greater control. Ability: Each orb of the chain contains a concentrated form of the venoms produced by Shizuka's shi kai; thus the venom combines the effects of Hekotareru, Chimayou, and Tachikiru. By manipulating the chain like a whip, Shizuka can launch individual orbs as projectiles, which burst in a cloud of poison (of about 10 feet in diameter) on impact. Conversely, Shizuka can absorb the venom onto her zanpaku's blade by stabbing through an orb. Because of the nature of infection by poison gas, which upon inhalation is absorbed into the bloodstream through the lungs, the venom when released by a projectile orb takes effect much more quickly than when released into a wound from Meimeidakatsu's shi kai form. Likewise, when absorbed onto the blade from an orb, the venom is in much more concentrated form than when generated in shi kai, thus it takes effect at the same rate as the gaseous form. The toxicity of the venom still depends on the opponent's spiritual pressure in relation to Shizuka's own reiatsu: the venom will begin affecting an opponent within 50% of Shizuka's spiritual pressure in 1 minute, and will travel through the system with increasing effect until treated. An enemy with a spiritual pressure less than 50% of Shizuka's will cycle through the symptoms at an accelerated rate, and opponents with 50% higher sp will take 50% longer for the poison to take effect and will have a slowed progression through the symptoms. Certain types of snake, including the venomous pit vipers, possess a pair of specialized thermoreceptors on either side of the head that allow the snake to locate their prey based on temperature differences within their environment. A pit viper can detect small animals that are only fractionally warmer than their background and strike accurately even in complete darkness. Since attaining ban kai, Shizuka has developed the ability to tap into this attribute of Meimeidakatsu's manifestation, but to detect reiatsu rather than heat. With this feat activated, she is able to sense, separate and locate the sources of even the weakest of reiatsu emanations in the area. Because the ability does not rely on regular sensory organs, it cannot be interfered with by techniques and abilities that confuse or dull the senses. Activation of the feat consumes 2% of Shizuka's reiatsu, and maintaining it in subsequent turns takes up a further 1% per turn. When attained at 10,000 connection, the radius of the area she can sense is 30'. With every additional 2,000 connection the range increases a further 10'. Shinigami specializing in reconnaissance and intelligence operations require the skills to gather protected data, glean information from reluctant sources, and even infiltrate enemy ranks. In order to be capable of these covert undertakings, Shizuka has honed her control of reiatsu and reishi to be able to take on the appearance of another person. Similar to Rei Jiiro's Kage no Heigou, but with opposite effect, Kage no Kamen is accomplished by the manipulation of reishi to produce a series of optical illusions that create the image of another person in Shizuka's place, and by the manipulation of reiatsu to match the spiritual pressure signature of the person being imitated. The illusion is only visual; however, if necessary Shizuka can drain 10% of her spiritual pressure in order to solidify the illusion to the touch for a few minutes. Special Item:[ Kageori ] - "Shadow Weave" A methodically designed uniform made especially for the 2nd Division. Its overall appearance differs from that of a standard Shinigami uniform. The fabric, a special shadow weave, has the characteristic of subtly appearing even darker than the standard black uniform. The Kageori's unique composition affords its wearer with added protection against the elements, and having been traditionally dyed with indigo, it prevents any cuts and wounds from becoming infected. Within both of the gi's breast interiors are a number of cleverly hidden, yet sturdy pockets positioned for easy access. Also within the sleeves are a number of additional pockets, as well as cords and special embroidery from which certain items may be attached upon for ease of usage. Black socks are included with the uniform, allowing for the wearer's feet to easily blend in with the hakama's jet-black coverage. ** [ Joukyuu Reiatsu ] -- "Advanced Reiatsu" Through learning hidden arts involving the secrets of Reiatsu sciences, the user is able to manipulate his/her Reiatsu with utmost control and mastery. By attaining this knowledge from the 2nd Division, the user is able to latch him/herself onto almost any non-ground surface, i.e. walls and ceilings, by creating a pool of adhesive Reiatsu from the limbs. Also within attaining this Technique, the user is able to masterfully conceal his/her Reiatsu emission, thus granting the ability to sneak through enemy ranks unnoticed. ** [ Shungyouran ] -- "Instant Fury" At dire times, it may be necessary to incapacitate the opponent within as small a space of time as possible, especially on occasions in which speed and efficiency are paramount. Shungyouran, one of the 2nd Division's finest Techniques, is taught for the sake of fulfilling this very goal. Having honed the ability to execute Shunpo to great effect, the user realizes the virtues and mechanics of initiating the said Technique, and as such, Shungyouran is born of this knowledge. - Flurrying and inaccurate attacks, Techs, and Feats cannot be used. Currently, Senpuuken cannot be used. - Precise attacks, Techs, and Feats are augmented. Currently, Hebijutsu practitioners that have Sakuganki may use the Technique with twice as many thrusts and maximum uses. Throughout history, many Techniques and abilities have been developed to refine the use of the Kidou energy and enhance its potential; while holding a vast arsenal of spells, Kidou specialists have enjoyed a huge collection of abilities that took their battle prowess even further, leaving those who were not blessed in an affinity to the art in their dust. As a part of an attempt to grasp something that could never be theirs, those less talented in Kidou invented the technique called Houganbiiki, they have specialized in one single Kidou and by doing so have taken it to heights not seen before. Houganbiiki is "attached" to a certain Kidou spell (only within the first 1~33 range), reducing its cost by 25% and boosting its effect and/or range by 30%, the user is also able to cast the spell without the necessary incantation even without learning Eishouhaki; furthermore, he is granted the ability to manipulate the Kidou to a certain degree in a strictly cosmetic level. However, the power penalties of Eishouhaki still apply to the bypassed Kidou spell. *Volumes are listed according to the timeline of the plot. Volumes in italics were posted out of order. Effect range: Short range, attack can explode on contact or command. Attack: User gathers spiritual energy into the palm, until it's about as big as a tennis ball. The ball is then releases at high speed, though it has a limited range of about 20 - 30 yards. The ball stays solid as long as the user clasps their hand as if holding a ball, if their hand is quickly outstretched the ball will explode, hitting anything within a 5 ft. radius. Phrase: The earth trembles. The children of the sky scream in retribution. Hadou #7, RAKURAI!!! Effect range: Long range beam attack. Attack: User gathers spiritual energy into the palm, until the energy forms around his/her forearm. He/she then releases a searing electric blade that travels over fifty feet and last for about five seconds. Phrase: Thor's pride springs forth from me. The power of the skies give me strength. The driving will cutting through my enemies. Hadou #24, RAIGEN!!! Phrase: "Return to the way you were... Be free of weakness...Expel your pain... Chiyudo #18, Tereiki!" * Description: A higher form of Antidote (Chiyudo #5), Chuuwa neutralizes medium level poison effects. Low and medium level poisons will be cured and neutralized completely, while higher level poisons (depending on the difference in SP between the user and the target) will either be stopped temporary or slowed. * Range: Within 2 ft of the target. To cast this, the user guides reiatsu toward the wound by holding their palm toward the wound. Healing reiatsu must enter an open wound to dispel the poison. * Incantation: From this body, neutralize any evil that may harm it, banish any pain it may feel and leave it free... Chiyudo #30, Chuuwa. Kankatsugan is a powerful surveillance Kidou used by high-level shinigami. It greatly increases a shinigami's field of vision. They also become able to detect and separate every energy signature in their range perfectly. The kidou has a limit though, and will strain the user's eyes if used for too long. Description: A mere extension of the middle finger and this fearsome binding spell occurs. Dense, powerful sheets of spiritual pressure plunge into the target, immobilizing them completely.